My wife and I attended the J.M.W. Turner exhibit at the Dallas Museum of Art on Saturday, April 12, 2008. The exhibition is the largest and most comprehensive ever presented in the U.S. of the career of J.M.W. (Joseph Mallord William) Turner (1775-1851), one of the greatest landscape painters in the history of art, and features approx. 140 works, divided almost evenly between oils and works on paper. It’s interesting to me, I guess in some twisted sense, to see the mistakes that the master painters made; it’s perhaps like seeing pro golfers make bad shots—it reminds me that everyone makes mistakes. In this vein, probably the thing that stood out to me the most was the way that Turner rendered the human figure in his paintings. People were rendered at the level of detail as a sketch; this lack of detail contrasted sharply with the extremely fine detail of landscape features, many times right next to each other. This incongruous juxtaposition made the differences in detail even more pronounced. You can see an example here, in “The Decline of the Carthaginian Empire.” It’s as if he really didn’t care much about rendering people, and just used them to perhaps provide scale. One of the featured paintings, and one of his most famous, is “The Burning of the House of Lords and Commons.” Appearing in the same exhibit room as this painting were watercolor sketches made as preliminaries for the actual painting. I found these quick, sketchy watercolors to be perhaps the most interesting display of all. Each sketch appeared to have taken about 5 minutes each to create (there were about a dozen in all). It seemed like he must have painted these in real time, similar to how we might take photos in rapid-fire fashion, as he watched the building burn from a distance. 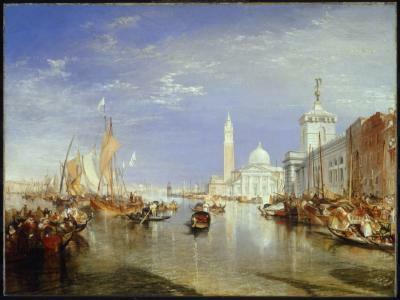 Turner probably never meant these sketches to see the light of day, but here they were in a major museum exhibit. Lesson: never discount the value of your sketches! Another notable thing: Turner used beautiful, exotic blue pigments for sea and sky which look markedly different than our modern blue pigments. Turner’s detail and skill in his rendering of seascape and sky/clouds is amazing and this alone is, I feel, what sets him apart from other artists. The Dallas exhibition was excellent in every way (including the audio commentary, examples of which can be heard here), and it was well worth the airfare to Dallas to see it. The exhibition appears in only two U.S. cities, Washington D.C. and Dallas, and the Dallas exhibit runs only until May 18, 2008. If you live near Dallas, go see the show! I’m now eagerly awaiting the delivery of the 320-page exhibition catalogue. It was available at the museum shop $60 USD, but I found it online at Amazon.com for about $35 USD.